On this site on September 6, 1901, Vice President Teddy Roosevelt was a guest at the home of Lieut. Gov. Nelson Fisk to be the main speaker at the annual meeting of the Vermont Fish and Game League. Here Roosevelt learned that President McKinley had been shot in Buffalo, NY. McKinley died eight days later and Roosevelt became the 26th US President. Erected 2008 by Vermont Division for Historic Preservation. Location. 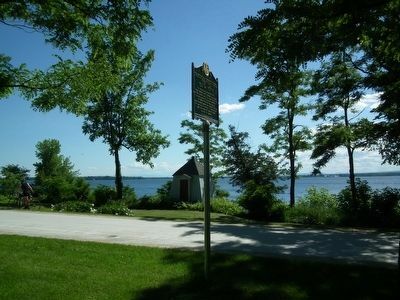 44° 50.806′ N, 73° 21.85′ W. Marker is in Isle La Motte, Vermont, in Grand Isle County. Marker is on West Shore Road 1.2 miles south of New Road, on the right when traveling north. Touch for map. 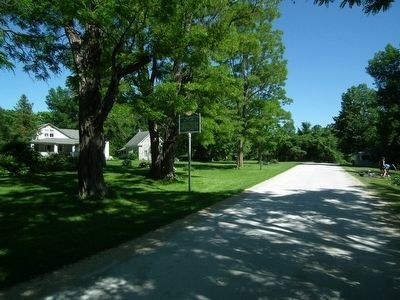 The marker is located on a dirt/gravel road, the condition of which may not be ideal in winter/spring. Also, some roads in this remote location are prone to flooding during the spring. Proceed with caution!. 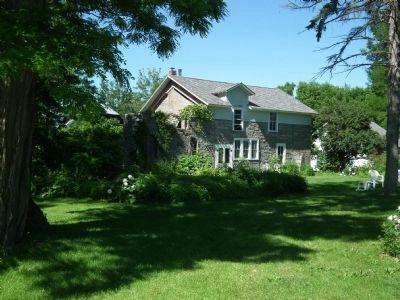 Marker is in this post office area: Isle La Motte VT 05463, United States of America. Touch for directions. away in New York); Benedict Arnold (approx. 2.3 miles away in New York); Sweet's Ferry (approx. 2.6 miles away); Benjamin Franklin (approx. 2.7 miles away in New York); Sept. 11, 1814 (approx. 2.9 miles away in New York); A Place Of Pilgrimage (approx. 3.8 miles away); Site of French Fort Ste. Anne (approx. 3.8 miles away). Touch for a list and map of all markers in Isle La Motte. 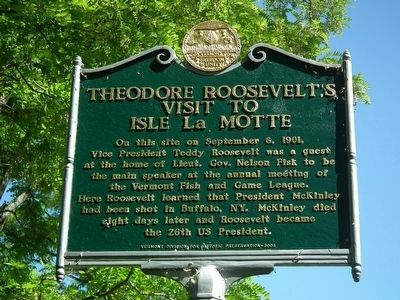 Regarding Theodore Roosevelt's Visit to Isle La Motte. Nelson W. Fisk, was active in Republican politics in the State of Vermont and eventually became Lieutenant Governor. Nelson Fisk entertained President McKinley in 1897 and Vice President Teddy Roosevelt on Sept. 6, 1901 on the occasion of the annual meeting of the Vermont Fish and Game League which was hosted at Fisk Farm. NY. He was rushed away by boat and railway to the president’s bedside. Hopeful that the president would recover Roosevelt continued his vacation in the Adirondacks. Ten days later, word came that the president had died. Theodore Roosevelt went on to become the 26th President of the United States and the ﬁrst conservationist president. This 1967 portrait of Theodore Roosevelt by Adrian Lamb after Philip de Lászlo's 1908 original hangs in the National Portrait Gallery in Washington DC. “No one ever craved the presidency more than Theodore Roosevelt or used its powers more joyously. In early 1901, however, his rise toward that office was suddenly checked. Having gained national prominence as a civil service reformer, Spanish-American War hero, and reform-minded governor of New York, he was now relegated to being William McKinley's vice president. But McKinley's assassination several months later changed everything, and Roosevelt was soon rushing headlong into one of American history's most productive presidencies. 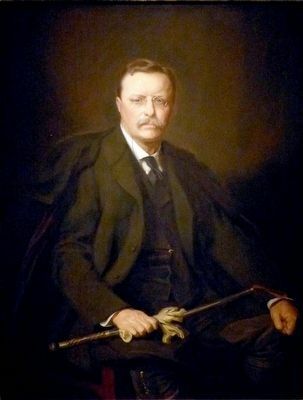 By the time he left office in 1909, his accomplishments ranged from implementing landmark efforts to conserve the nation's disappearing natural heritage, to instituting some of the first significant curbs on the excesses of big business, to building the Panama Canal. More. 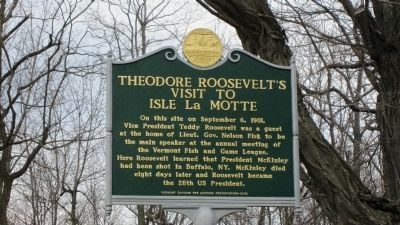 Search the internet for Theodore Roosevelt's Visit to Isle La Motte. Credits. This page was last revised on June 16, 2016. This page originally submitted on November 19, 2012, by Steve Bergeron of Milton, Vermont. This page has been viewed 429 times since then and 4 times this year. Last updated on June 23, 2014, by Kevin Craft of Bedford, Quebec. Photos: 1. submitted on November 19, 2012, by Steve Bergeron of Milton, Vermont. 2, 3, 4. submitted on June 23, 2014, by Kevin Craft of Bedford, Quebec. 5. submitted on October 24, 2015, by Allen C. Browne of Silver Spring, Maryland. 6. submitted on June 23, 2014, by Kevin Craft of Bedford, Quebec. • Bill Pfingsten was the editor who published this page.